Are you in a mood to play casino slots online makeover? Makeover magic allows you to preen your looks with 4 girls from the city. Pamper yourself with this manicured classic and attempt to extend your shopping budget in this 25 payline slot. Eyecon was founded in 1997 as a computer games company. In 1999 they first build an online casino system, developing timeless spin slot games since 2003 with their first title Temple of Isis. They have become extremely popular and offer a variety of games to choose from. They value a lot their audience and create games with their players in mind, creating games that their players love. There are many games out there that can perfectly substitute for when your girlfriends are not free on the weekend, and Make-Over Magic is one of them. This video slot gives you the absolute shopping centre experience with the relaxing tunes in the background you would expect to play in your favourite hair salon. 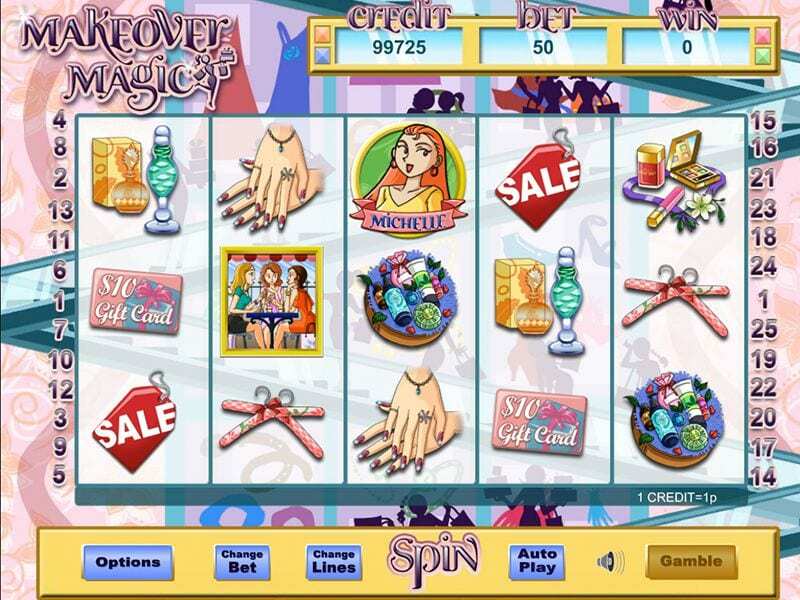 Popular online slots such as this game have high RTPs where players prefer to play time and time again! The aesthetics are rather simple with a shopping centre in the background and simple 5 reels covering it. All the symbols and characters are very stylized and are a mix of cartoon and manga. The symbols on the reels are all items you can't miss on a weekend with the girls: a pair of boots, a bag, manicured hands, sale tags, gift cards, perfumes, a pink watch, makeup and a compact mirror. When you see one of the girlfriends getting a makeover at the hair salon in one of the 3 lines you have found the wild. The wild can replace any of the symbols except for the scatters. In this lovely video slot, the scatters are what makes it profitable and exciting. Get 3 or more cafe symbols to win yourself some beautiful free spins. Your payout will be doubled in the period of the free spins and you can retrigger this feature up to 15 times giving you the opportunity to win up to 400 free spins. Each reel has different girlfriend symbols. Get three or more of them together in a spin and they will all join for a Prize Pick feature. For each girlfriend participating in this feature, you get a pick. This increases your chance to win up to 100 times your original bet. This feature cannot be triggered during the free spins period. Haven't got enough features yet? Then wait for the gamble feature! With this feature, you get the opportunity to double your winnings by selecting correctly one of two options, easy right? To participate in this gorgeous makeover you have to bet at least 25p or up to £12.50 pounds, and with 25 paylines and the amazing bonus features can make this game easily profitable for you. This is perfect for anyone that loves a little makeover and some time at the mall or hair salon. The atmosphere of this game will take you right to those places, but this time rather than spending all the money you get the chance to take winnings with you. With the bonus features that can be triggered by the scatters you can make a very lucrative game out of it. And up to 400 free spins is absolutely amazing giving you lots and lots of opportunities to win more than enough to reward yourself afterwards with an actual new haircut or pair of shoes!